Just like Haku, Zabuza is what they call a "missing-nin". After his failed Coup d'etat on the Mizukage he had to abandon the Hidden Mist Village and became an exile. Now, constantly on the run for the village's hunter-nins he's looking for a way to get his revenge. He's a master in assassination jutsu's and offers his services for that purpose to anyone who can pay him, he joins arms with scum like Gato to fund his revenge. 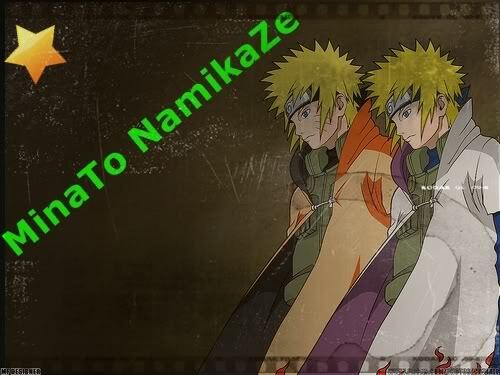 Zabuza is a cruel man who knows no mercy, yet he tolerates a boy named Haku in his presence. He looks at Haku as his tool and uses him the way he likes. In order for a Ninja Academy student to graduate and become a Genin in the Hidden Mist Village, he or she had to fight, with one of the same friends they trained with, to the death. But all of this had to be changed 10 years ago when one of that year's students killed over 100 peers without hesitation. This child was Zabuza. Because of this the Village was forced to change the final exam for he graduating class, and is commonly referred to by other villages as "Bloody Mist Village". From that day on, Zabuza was known as "the Devil of the Hidden Mist". 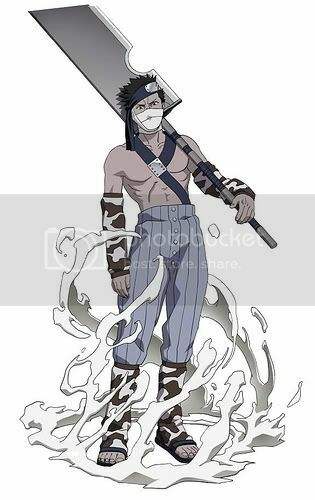 Zabuza is one of the seven shinobi-gatana (swordsmen) of the Mist and is equiped with a very big chopping blade. He makes his first appearance as one of Gato's henchmen who's after the bridge builder, Tazuna. He fights and loses to Kakashi twice, and was only able to survive the first accounter because of Haku's fake hunter-nin appearance. At the very end he kills gato, and has the soul request to die laying next to Haku. It's a very touching scene where it begins to snow ("haku is crying") and Zabuza says: "Haku, I'm sorry, I hope I can go to the same place you're going to.". He dies as a shinobi who has led a difficult life, and only realized at the very end that a shinobi isn't a mere tool who can feel no emotions.